1. Once you have entered your Moodle course and are looking at the homepage for your course, click the link Question bank in the Course Administration block. 2. You will see sublinks for Questions, Categories, Import, and Export. 4. 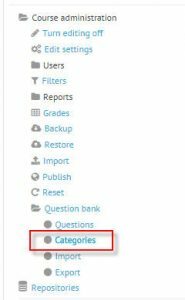 The page that appears after you click the Categories link is divided into two sections: 1) existing categories (including a default category for your course) and 2) an area to add new categories. If you’ve never added any categories, you’ll only see the default folder/category in the first section. In the second section on this page labeled Add Category, enter the name of your category. Remember to avoid using special characters in your folder names (such as * / # % () ) You don’t have to enter any category information under the name you’ve entered, unless it’s helpful to you. 5. Keep adding categories for each grouping of questions you anticipate creating. For example, you may wish to create a folder for a set of questions about a particular topic or for an exam (such as mid-term or final). 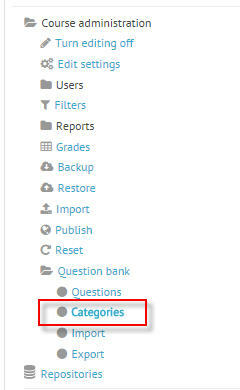 Your created categories will show up in the list of available categories in the first section of this page and will be available to you later when you add questions.